Handmade Indonesian Onyx and Silver Cocktail Ring, "Oracle"
A sterling rope surrounds a polished black onyx in its argent embrace. Bali's legendary silver granules adorn the ornate band. Graceful and feminine, this ring comes from Balinese designer Komang Wijayana. 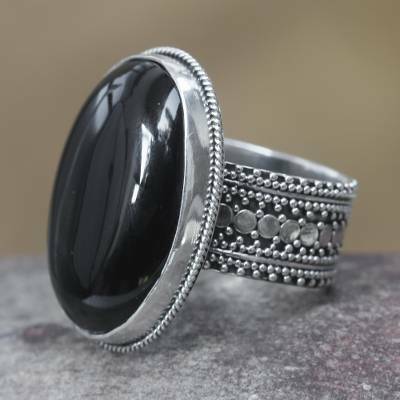 You can find onyx cocktail ring 'Oracle' by Komang Wijayana in jewelry categories such as Modern Rings, Birthstone Rings, Onyx Rings, Silver Rings, Sterling Silver Rings and Cocktail Rings. Enjoy exploring these sections for other Novica treasures. The band on this ring is so intricate & perfect to showcase this beautiful onyx. It does run a tad small but also fits securely. Get lots of compliments when I wear it. I have been wearing my ring since I took it out of the box. It is by far my favorite ring that I have ever bought. It is very well made and the design is beautiful. The size is true. Thank you Komang. You are my favorite artisan and your craftsmanship is superb! "Excellent quality and beautiful design"
I'm wearing this ring now is it so beautiful. The design on the band is beautiful and detailed design.